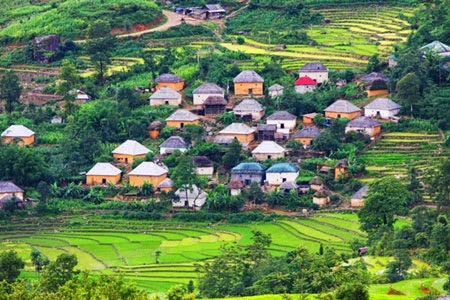 Y Ty, one of the poorest communes in Lao Cai Province's Bat Xat District, has become an attractive tourism destination in recent years due to its natural beauty. 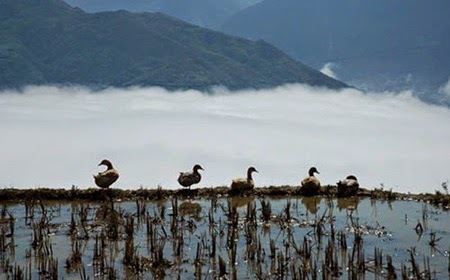 Nestled against 2,700m Nhi Cu San mountain, the commune rarely sees the sun and is often covered by dense white clouds. Leaving Lao Cai train station and driving the 70km to Bat Xat along mountainous roads that stretch like wild snakes, you will reach this foggy land, 2,000m above sea level. From the car windows, you can see zigzag tracks sunk deep in forest leaves and houses that appear and disappear in the clouds. "Coming to Y Ty, I thought I was lost in another world," said 25-year-old Trinh Hai Yen. Clouds cover the roads, villages and mountains, merging with the horizon right in front of you. No wonder visitors have the experience of entering a different world. Terraced fields rise and fall on the hills, beautiful all year round. According to Yen, May is "pouring water season" in Y Ty. As locals transplant rice seedlings, visitors are treated to the sight of glittering ponds. After that, the hills are covered by green. Above it all: Clouds are seen everywhere in Y Ty. "Terraced fields are full of glittering water running from high mountains. They pile up like stairs to the sky and co-ordinate with colourful clouds to create an awesome painting," said Yen. Professional and amateur photographers welcome the chance to take stunning photographs. "I am very interested in taking nice pictures of clouds and fields. This is the third time I have been here," said 30-year-old amateur photographer Tran Van Thuong. According to user kynhong's post on nhiepanh.vn, when the sun appears, you can see colours in each field: the yellow of fields that have just been ploughed, the brown of land, the violet of mud and the green of new fields. After it rains, clouds swoop down to the surface of fields like white blocks of cotton. Kynhong has gone to many places to take photographs such as Sa Pa, Mu Cang Chai, Bac Ha and Muong Khuong, but for him Bat Xat was the most attractive due to the imposing altitude. Terraced fields are typically 1,500m above sea level, but the terraced fields in Y Ty are over 1,600m. Among the various ethnic minority groups in Y Ty, Ha Nhi people are known for making terraced fields. Despite variations in terrain, they still create wide, beautiful fields that fit the curves of valleys and high mountain slopes. A trek through the commune offers a fabulous view of earthen houses, which have unique architectural features. 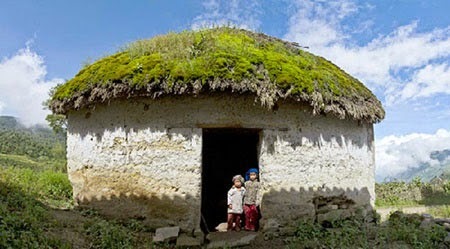 The houses have 40-50cm-thick walls made of clay and roofs made of straw grass. Their average area is about 60-80sq.m. They have only one main door and a small arched window for ventilation, retaining warmth in the winter and coolness in the summer. Seeing the simple architecture of earthen houses, no one would think that people here have to spend around one month building them. The time to repair or build houses is after each crop. After choosing a suitable place, they begin to lay the foundation with stones. Then they build the walls. Soil is put into a mould and people use wooden pestles to jam the layers together, creating solid walls. Finally, they fit wooden beams and purlins together to shape the roof. Seen from above, the houses resemble huge mushrooms. According to Yen, before leaving, you shouldn't miss the chance to visit the Saturday market, full of the agricultural products and colourful traditional clothes of Ha Nhi, H'mong, Dao and Giay people. 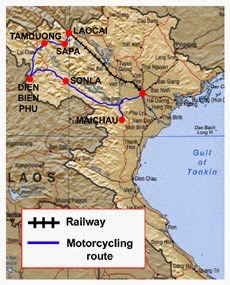 ACTIVETRAVEL ASIA would like to recommend Motorcycling Northwestern Trails tour.Discover Vietnam’s rugged and scenic northwest and its people first hand. By taking to the roads and riding from the capital Hanoi to the remote area of the northwest we can see life as it truly is for the Vietnamese. The perfect itinerary and the support crew ensure you get the most out of the trip in terms of comfort, enjoyment and adventure. Along the way we encounter dramatic landscapes and sweeping panoramas as the rural population goes about its business. Highlights include the terraced valleys of Sapa, challenging roads, stunning scenery and many different colorful minority groups.